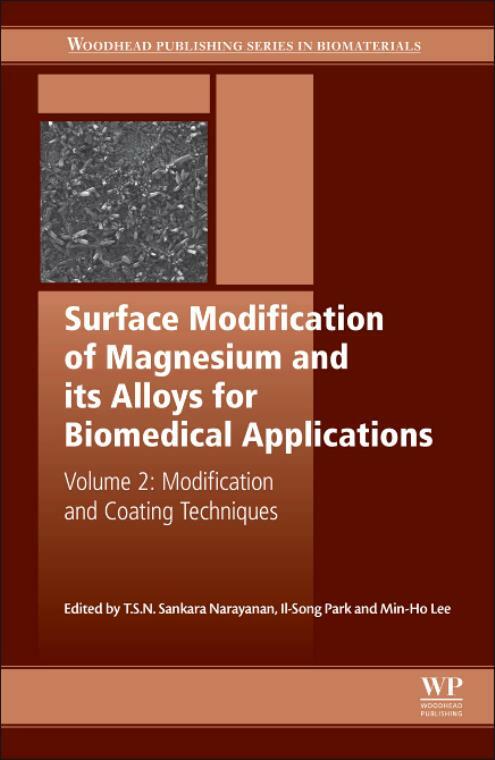 Surface modification of magnesium and its alloys for biomedical applications: Biological interactions, mechanical properties and testing, the first of two volumes, is an essential guide on the use of magnesium as a degradable implant material. Due to their excellent biocompatibility and biodegradability, magnesium based degradable implants provide a viable option for the permanent metallic implants. This volume focuses on the fundamental concepts of surface modification of magnesium, its biological interactions, mechanical properties and, in vitro and in vivo testing. The contents of volume 1 is organized and presented in three parts. Part 1 reviews the fundamental aspects of surface modification of magnesium, including surface design, opportunities, challenges and its role in revolutionizing biodegradable biomaterials. Part 2 addresses the biological and mechanical properties covering an in vivo approach to the bioabsorbable behavior of magnesium alloys, mechanical integrity and, the effects of amino acids and proteins on the performance of surface modified magnesium. Part 3 delves in to testing and characterization, exploring the biocompatibility and effects on fatigue life alongside the primary characteristics of surface modified magnesium. All chapters are written by experts, this two volume series provides systematic and thorough coverage of all major modification technologies and coating types of magnesium and its alloys for biomedical applications. T.S.N. Sankara Narayanan works for the Chonbuk National University, Republic of Korea and is associated with the Department of Dental Biomaterials and Institute of Biodegradable Materials, Institute of Oral Bioscience and BK21 Plus Project, School of Dentistry. Il Song Park works for the Chonbuk National University, Republic of Korea and is affiliated to the Division of Advanced Materials Engineering and Institute of Biodegradable Materials. Min Ho Lee works for the Chonbuk National University, Republic of Korea and is associated with the Department of Dental Biomaterials and Institute of Biodegradable Materials, Institute of Oral Bioscience and BK21 Plus Project, School of Dentistry.